It's not too late to enjoy fresh, homemade pesto, with fresh basil still available at the farmers market. It's the perfect foundation for a variety of meals--pasta, being an obvious one, but it's also great slathered on bread and even mixed into risotto. 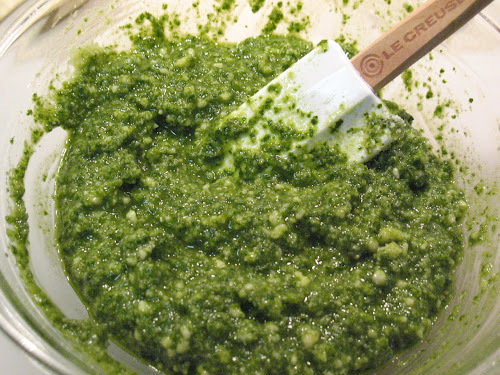 Basic pesto is a simple blend of olive oil, basil, garlic, nuts, salt and parmesan cheese. Some recipes will call for other things, such as parsley in addition to the basil. And I found an America's Test Kitchen recipe that includes mayonnaise and spinach, but personally, I like to keep this simple, letting the basil and cheese be the star players with the nuts providing a savory side note. The traditional nut in pesto is pine nuts; however, other nuts can be used too. I tried making it with walnuts and I noticed no major difference in flavor. With pine nuts becoming more expensive lately, this might be an attractive substitute. In seeking a solid basic recipe for pesto, I consulted the usual suspects. Mark Bittman has a nice, simple recipe, although when I made it, I thought it was too oily. However, I do like that his recipe calls for adding some of the oil gradually with the food processor running, since the oil emulsifies the pesto, smoothing it out. Julee Rosso and Sheila Lukin's The New Basics Cookbook employs a similar technique and uses less oil, but doesn't call for nuts or cheese, treating these as optional add ins rather than essential ingredients. America's Test Kitchen's New Best Recipe cookbook calls for bruising the basil first (sounds interesting, but potentially not necessary) and toasting the nuts in a pan (a good idea). Place basil, half the olive oil, garlic, salt and nuts in a food processor. Process until well combined, scraping down the sides a few times as needed. Turn the processor on and add the remaining olive oil slowly through the feed tube. Transfer mixture to a bowl and stir in the cheese. Your pesto is really good. Thanks for making it!